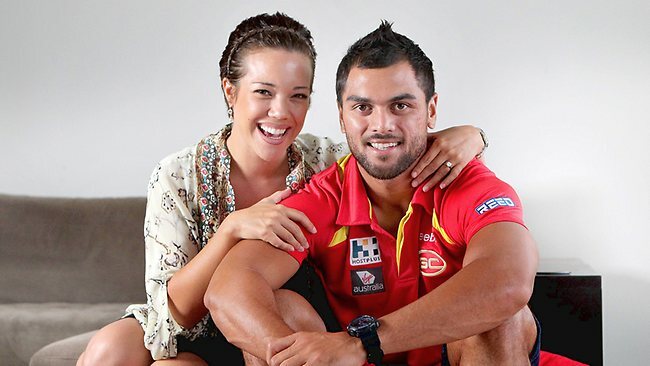 AFL player Karmichael Hunt, and his fiancée Emma Harding, welcomed their first child this week, and have named their daughter Halo Amelia. Karmichael is originally from New Zealand, and moved to Australia as a child. He began his sporting career playing rugby league, debuting for the Brisbane Broncos in 2004, winning the Dally M Rookie of the Year Award and the Brisbane Broncos Rookie of the Year Award. Despite being eligible to play for New Zealand, the Cook Islands and Samoa, he only ever played national rugby league for the Australian side. In 2009 he switched to rugby union, and played for the French team, Biarritz Olympique. Last year, he changed codes again, and began playing in the Australian Football League with the Gold Coast Suns. Although he has come under a lot of criticism over his decision to swap codes, he won his team’s Most Improved Player Award for 2011. Emma is the sister of former AFL footballer Scott Harding, who now plays American football in Hawaii. Scott and Karmichael attended the same school together, the Anglican Church Grammar School. Emma’s brother Justin plays for Labrador in the North East Australian Football League. Her mother is from the Polynesian island of Tuvalu.